The Baltimore Holocaust Memorial is located at the intersection of Lombard and Gay Streets in downtown Baltimore. 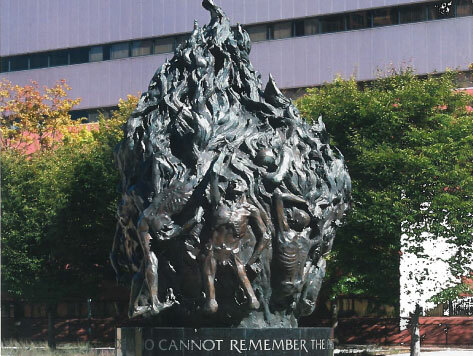 As a tribute to the families and victims of the Holocaust, the Memorial features a statue portraying emaciated bodies engulfed in a ball of fire. Also located at the plaza is a plaque with an inscription by author Deborah Lipstadt and an empty rail yard representing the railway system that transported millions of Holocaust victims to the concentration camps. The Memorial is located just two blocks from the Baltimore Inner Harbor and its attractions, including the National Aquarium, Top of the World Observatory, Baltimore World Trade Center, and Historic Ships in Baltimore.